The first outing of the year will be to Warwickshire and Leicestershire. We spend the morning at Avondale Nursery, last visited in 2009. Val Bourne rated this one of her top five nurseries in the Autumn edition of the HPS Journal. Brian Ellis is our April speaker talking about his Library Garden and so this will be a good opportunity to see it ‘for real’. On arrival, Brian will offer a warm welcome and introduction to the garden which holds several National Plant Collections. He will remain throughout the morning to answer any questions. There will be time to explore the vast array of flowers and ornamental plants and to buy from the well stocked nursery. On the same site is the newly opened John Gillies nursery specialising in rare and unusual plants. We then make a return visit over lunch to the Garden Barn, Lutterworth. For those who have not previously visited the Garden Barn, I can only describe it as a cornucopia of anything of interest to a gardener including plants, unusual objects and antiques. It also has an excellent cafe and they didn't mind us eating our own lunch there. After lunch we travel to Earl Shilton to visit Barracca, a one acre garden with many different areas to explore, lawns surrounded by herbaceous plants, shrubs, a patio area with climbing roses, silver birch walk and a utility garden. In the 1920’s this was part of a nine acre garden open to the public. Friday 8th July This outing is to Derbyshire and Staffordshire. In the morning we visit 10, Chestnut Way, Repton where a pair of passionate gardeners will offer a guided tour of this one acre plantsman's garden with mixed borders, mature trees, a 10 year old arboretum and much more including, they claim, an excellent plant stall. We then travel to Staffordshire for the midday stop (please bring your own lunch) at Yew Tree Cottage, Haughton, a ½ acre Hardy Planter’s garden brimming with unusual plants with all year round interest including meconopsis, trillium, arisaema and dierama. Plants will be for sale. There will be seating around the garden to eat your lunch. Tea, coffee and biscuits are included. Those who visited in May 2015 will recall an inspirational garden with planting at its best including unusual trees, shrubs and perennials. This month we will see very different planting. We can also look forward to a delicious selection of cakes along with tea and coffee and more plants to purchase before the return journey. The first stop of the day is 2, Manvers Street, Ripley, described as an awe-inspiring oasis featuring 10 borders bursting with colour, immaculate lawn, perennials, including over 26 clematis, annuals, baskets and more. There will be plenty of seating to enjoy the tea, coffee and scones provided, plus a plant stall to linger over. The property is situated in the town centre and there will be a short walk from the coach drop off point. We have arranged to go to Chatsworth Garden Centre where you can spend a couple of hours browsing the plant and gift shops, have lunch or if bringing a packed lunch can just purchase a drink and are welcome to eat in the seating area outside. The afternoon will be spent at Cascades Garden in Bonsall. Described as a fascinating four acre garden in spectacular surroundings, with woodland, high cliffs, a stream and ponds. Secluded garden rooms provide peaceful views, and there is an extensive collection of unusual plants and trees. Tea, coffee and cake are included. Whilst we will not be required to do any rock climbing there are gravel paths and some steep slopes. The Evening visit will take place on Tuesday 14th June. From 6pm - 9pm. It is always a very sociable event and an opportunity for members to ‘catch up’. 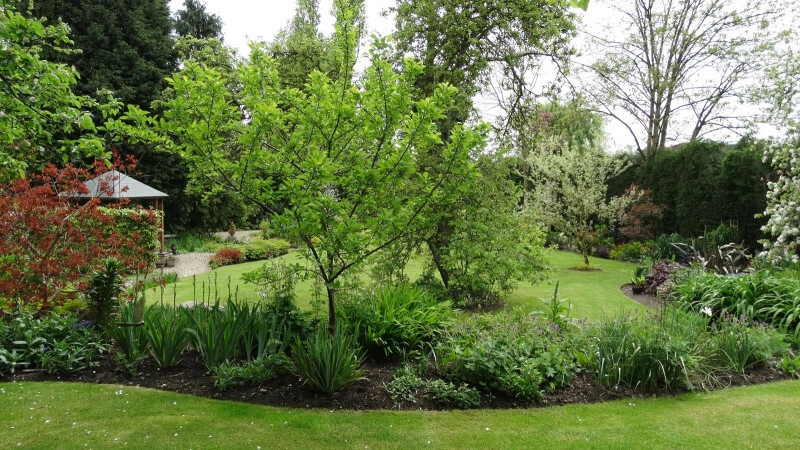 Members Sylvia and Michael Bennett have kindly agreed to open their delightful garden at Bingham, Nottingham. The price is £3.50 per person including tea and cake. A paved front garden with troughs and an entrance passage up steps lead to a small but unusually shaped suburban back garden on 3 levels. Started from scratch in 2006, it now has a lawn, fruit trees and shrubs with a small raised bed vegetable garden (partly enclosed in a fruit cage), climbers, a pond, newly planted herbaceous perennial bed and a tiny alpine bed. A lot in a small space!